The Black Voices section of the Huffington Post, ran that article Why It’s So Hard to Talk to White People About Racism earlier last week. Social scientists understand racism as a multidimensional and highly adaptive system — a system that ensures an unequal distribution of resources between racial groups. Because whites built and dominate all significant institutions, (often at the expense of and on the uncompensated labor of other groups), their interests are embedded in the foundation of U.S. society. While individual whites may be against racism, they still benefit from the distribution of resources controlled by their group. Yes, an individual person of color can sit at the tables of power, but the overwhelming majority of decision-makers will be white. Yes, white people can have problems and face barriers, but systematic racism won’t be one of them. This distinction — between individual prejudice and a system of unequal institutionalized racial power — is fundamental. While every other black leader in a post-1994 South Africa has been constructed as an inferior “other” by the dominant discourse, Nelson Mandela has been deified as a saintly black and is held in high esteem by whiteness. He has been hailed as a decent and rational African by the moderate liberal white discourse and thus relegated the status of “the most like a white person” worthy of becoming a signifier for white decency and humanity. He has been acknowledged as a human being while Jacob Zuma, as an example, remains a “primitive” — often depicted as oversexed, indecent and just plain stupid. These white constructions of blackness say more about our society than we care to admit — and the religiosity afforded Madiba by well-heeled whites speaks volumes about the morally assumed and systemic supremacy whiteness still holds in South Africa. This religiosity comes to life on Mandela Day, which takes place annually and plays out like a yearly church service in which the messianic effigy of Mandela is worshiped in a type of feel good marketing frenzy with “charitable giving” at the centre of it. By looking back in history at the construct of whiteness we will understand how Mandela Day becomes a neocolonial exercise premised on beliefs about what white and black signifies to the larger white imaginary. In fact Mandela Day has become an exercise in white missionary saviour behaviour in which whites can showcase their “good” side for the “good” of those less fortunate than themselves. It is through the Mandela construct that whites reaffirm their transcendent selves. The article draws quite a lot of controversy in the comments. My view is, the article is not so much about Nelson Mandela himself, rather his portrayal in the media. Therefore, I would tend to agree with her analysis. The African Union (AU) accuses the Hague-based International Criminal Court (ICC) of anti-African bias and even racism, and plans for a home-grown mechanism are inflaming a stand-off over who deals out justice on the continent. This would grant immunity to the likes of Omar al-Bashir and Uhuru Kenyatta. It would obviously be a huge step back for human rights in the continent, and prove once more that the African Union is failing to bring democracy to the continent. 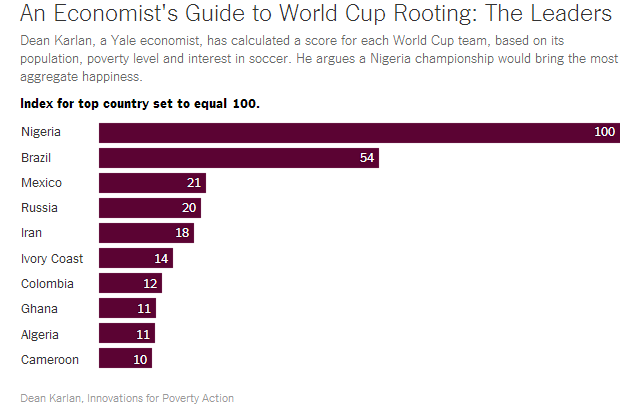 Dean Karlan, a Yale economist, has calculated a score for each World Cup team, based on its population, poverty level and interest in soccer. He argues a Nigeria championship would bring the most aggregate happiness. The basic principle is simple, drawn from utilitarian principles: Root for the outcome that will produce the largest aggregate increase in happiness. 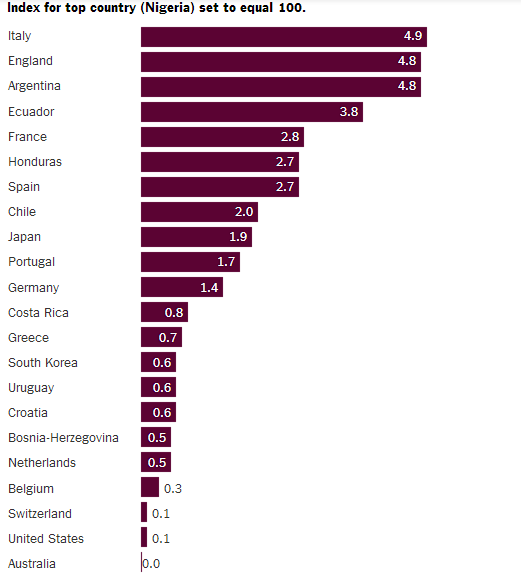 So I came up with a simple index, calculated by a country’s passion for soccer multiplied by its average level of poverty multiplied by its population. It’s perhaps a bit crude, simply to multiply these factors by each other, but the exercise highlights some important truths about the world. Why this formula? Considering soccer interest seems obvious enough — the more passionate fans are, the happier they’ll be if their team emerges victorious. I incorporate poverty into the score for several reasons. First, happiness and wealth are correlated, and all else being equal, a utilitarian would prefer to help the person who is worst off. Second, the wealthy have more outlets for dealing with sports disappointments — such as going out to a nice meal — and can bounce back faster. On the other hand, do not go for Australia, USA or Switzerland. In the light of the new legislation in Nigeria, Uganda and a few other countries, African intellectuals have expressed their concern about the regression of human rights across the continent. There has also been some nationalist posturing among supporters of the law. Homosexuality is ‘unafrican,’ they say, and we will not become like the west. The west is not exactly a homosexual haven; acts of discrimination against homosexuals are not uncommon in the US and Europe. But it is the idea of ‘unafricanness’ that is truly insidious.